Is slow internet making your life difficult in Southport? Do you need an internet solution fast? Then you've come to the right place. Hi, I'm your local Internet Magic Technician Doug and I have helped many customers become more productive and less stressed due to having access to the faster internet that they've always wanted. I want to make that a reality for you as well. Slow internet is not just annoying, but it can really diminish the productivity of your day, how accomplished you are and your mood. If you're trying to get important tasks done for your business, and you're internet connection is so unreliable that it keeps refereshing the page and losing all your work, then you are not going to have a good day and you're not going to be productive. But you don't have to put up with slow internet; you can enjoy fast, and reliable internet, each and every day when you entrust your connection to Internet Magic. 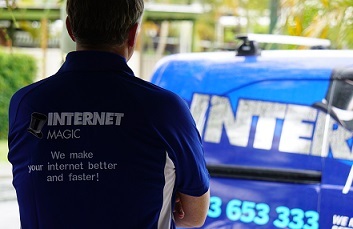 The other great thing about Internet Magic is that all your internet needs can be found in one place so, if you not only need help with getting some faster internet connected, but also want a parental lock on your pages to keep your kids safe, or if you need some new data points or even home automation, then Internet Magic is the service for you. I have a range of skills in the Internet industry and can make it hassle free and easy to get all of your internet problems solved at once. So why not give me a call today?